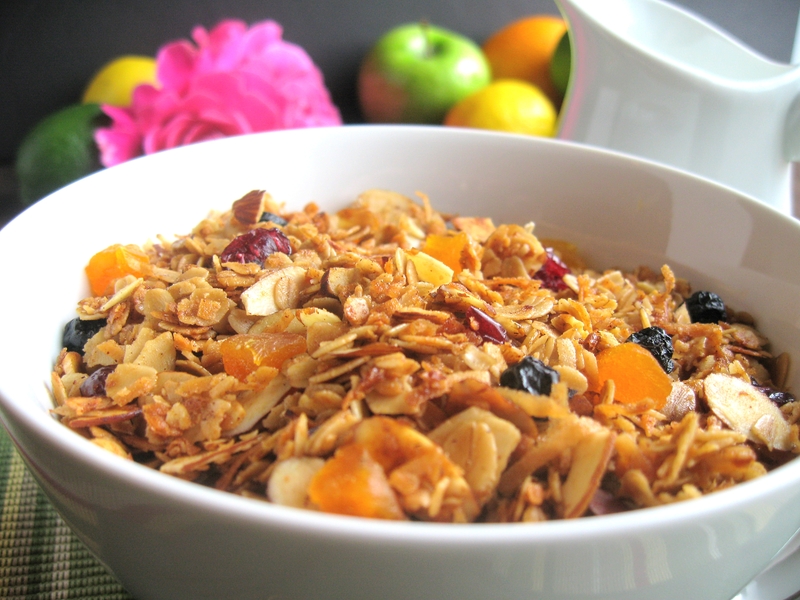 In honor of Fight Back Fridays over at Food Renegade (as well as Vegetarian Foodie Fridays, Friday Feasts, and Foodie Friday) I thought I would share with you this idea for your own fresh, homemade granola. I have been making my own granola for a long time. The flavor is so vastly better than most commercially available granola that it really is worth making yourself. The good news is that it is also easy. I like to mix and match the flavors, and play around with different dried fruit and nut combinations: cherry almond, cinnimon raisin, blueberry giner (with chuThe possibilities are really endless. Here old fashioned oats are mixed with sliced almonds, sweetened dried coconut, cinnamon, nutmeg, ground ginger, and a pinch of salt, and then tossed with vegetable oil, honey, and pure vanilla extract, and then baked. This is great on its own as a snack, as a cold cereal, as a hot cereal made with steamed milk, or as a topping for yogurt or ice cream. It is healthy, sweet, crunchy, nutty, and satisfying. Enjoy! I’ve been looking for the perfect granola recipe for a while. Maybe ginger is the key.. Thanks for sharing! 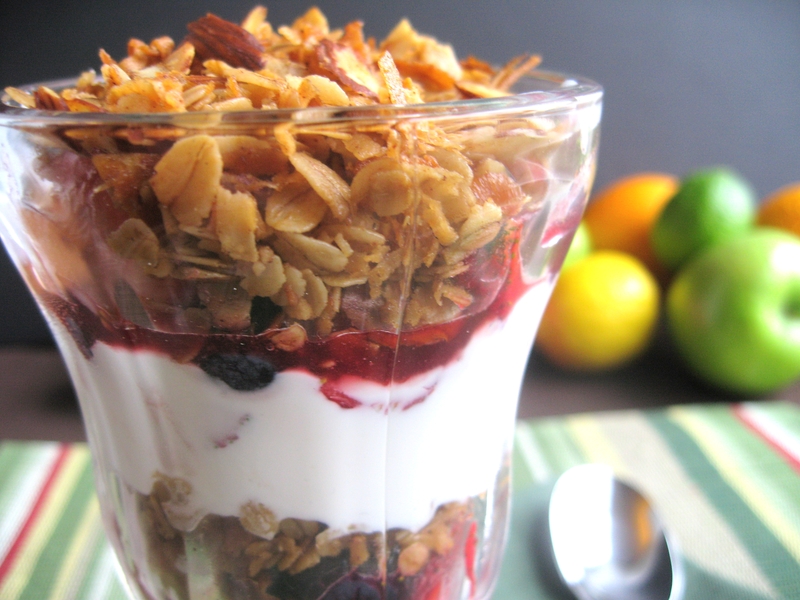 I eat granola on yogurt almost every day but have never made my own. Yours looks wonderful! I, too make my own granola. After experimenting with other recipes I make my without any oil and very little honey and more nuts (pecans and almonds). I love it too! I think I could eat granola every day of my life. I love it! Oh, how delicious this looks. 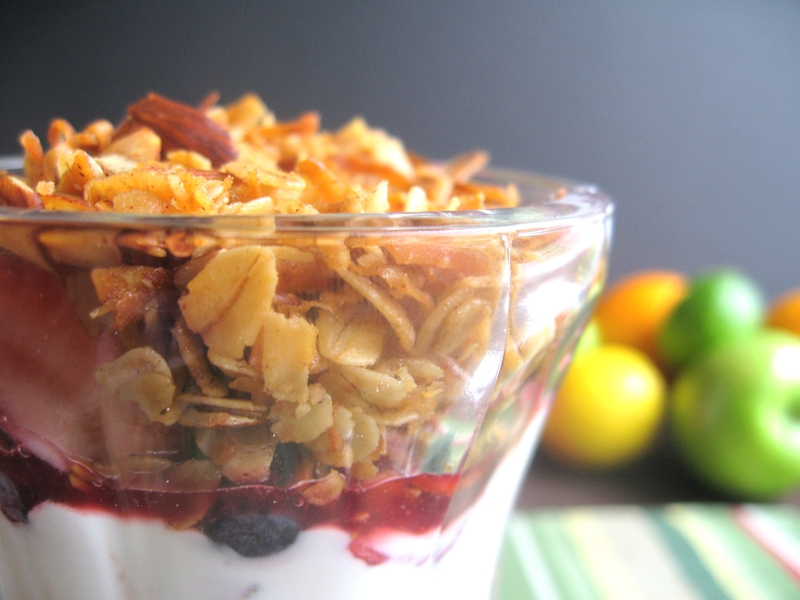 I am in need of making some more granola too. Will give this a try. Thanks for linking with me! 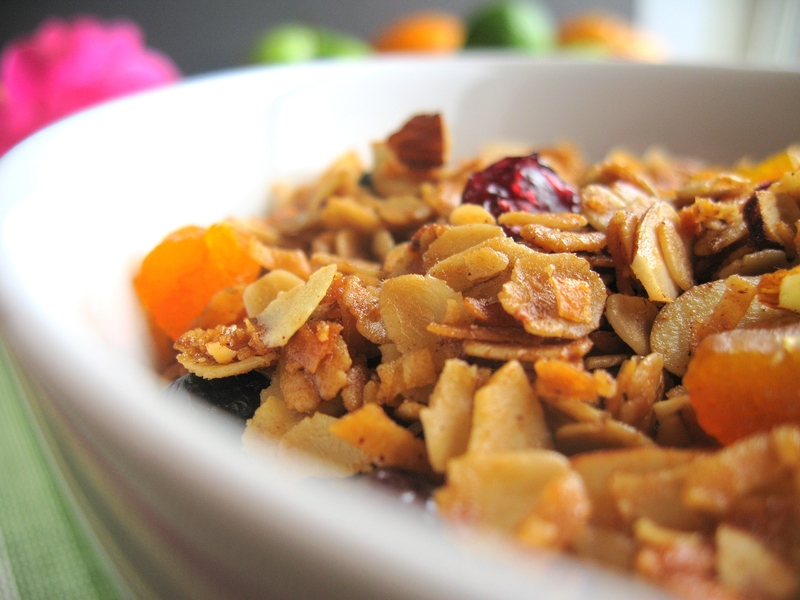 Your granola looks and sounds absolutely scrumptious! Thanks for sharing it.